Far Cry 5 was everything I wanted it to be, and more. Hours of Darkness (the first piece of DLC) stumbled a little bit in its delivery of a grim tale of survival, but Lost on Mars swings in the opposite direction: it is a wide-open playground comprised of a good handful of simple missions that never once takes itself too seriously. The opening minutes of Lost on Mars deliver another one of the charming retro-animation introductions fast becoming a staple of the fringe entries within the Far Cry series. We’re treated to a brief exchange between Nick Rye (NPC pilot and companion of the mounting resistance in Far Cry 5) and the ever-affable Hurk Drubman Jr., in which Hurk declares that Rye owes him a favour and is cashing in his chit. 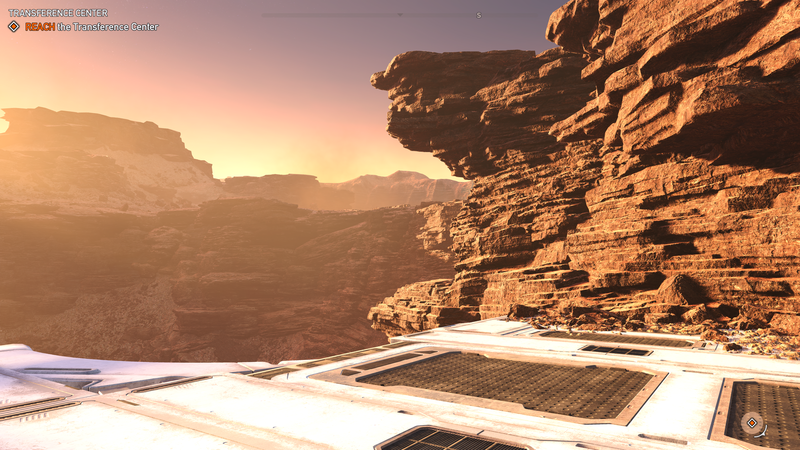 A moment later, you (now playing as Nick) have been teleported through space and into a command centre outpost on Mars, with only the disembodied voice of Hurk help you get your bearings. Hurk guides you through a few hallways, setting the scene for exactly why the two of you have been plopped into an otherworldly experience; namely that Mars’ population of alien arachnids have been planning a Thanksgiving-sized feast with Earth’s population serving as the main course. 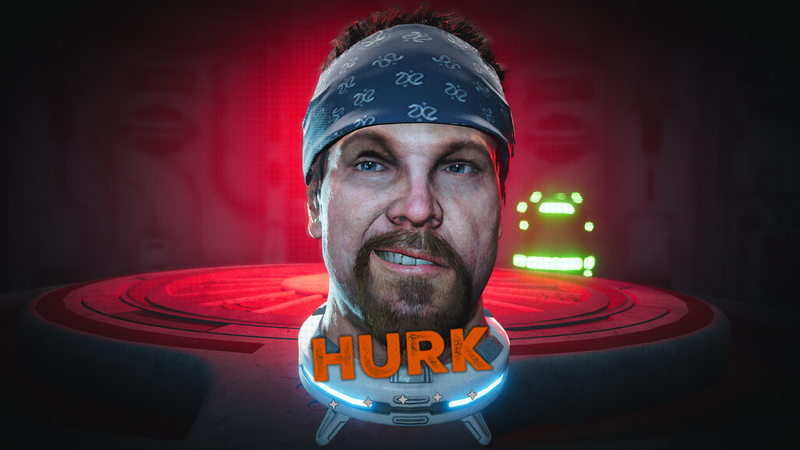 The first task assigned to you (one which forms the primary basis of the short-lived storyline) is to reassemble Hurk himself. As his story explains, he’d been minding his own business when he was summarily dismembered by Mars’ hostile alien race. Luckily his head was recovered and saved by an Artificial Intelligence named ANNE that’s mounting a resistance of her own against the arachnid-like aliens. It’s the first display of how Far Cry leans into the surreal and outlandish nature of its game worlds, and is a welcome step away from how serious Hours of Darkness played out. Hurk and ANNE subsequently explain the goings-on within the Martian landscape and send Nick out to begin reactivating ANNE’s various subnetworks, facilities, and systems that will give her enough power to fight back against the arachnids; who are reportedly en route to Earth for some serious snacking. Floating-Head-Hurk goes along for the ride in the body of a combat-ready robot (as your only Gun for Hire companion available), whereas ANNE remains behind as the disembodied logic-driven voice that plays diametrically to Hurk’s chaotic and blundering psyche. 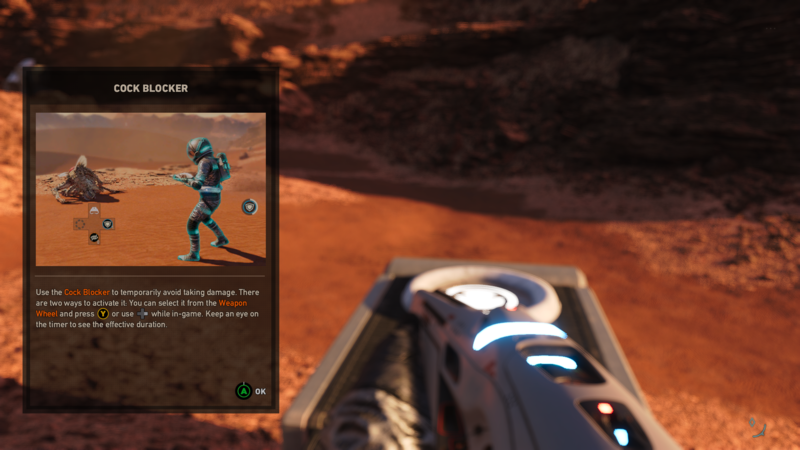 Once securing your Gravity Belt (read: jetpack), Lost on Mars lets you take on the remainder of the game at your leisure, in typical Far Cry fashion. The world map has a smattering of objectives to tackle, and no particular itinerary for which it expects you to handle them. The 3D-Platforming ‘tower climbs’ return as challenges to surmount, and many of the various facilities have ‘go-there-kill-bad-guys-boot-up-computer’ mission points attached to them as well. Considering that the entire experience is about reactivating ANNE’s systems, nearly all of those missions converge to the same end action: plunk in a power cell, turn on a computer, pat yourself on the back, and find the next computer. 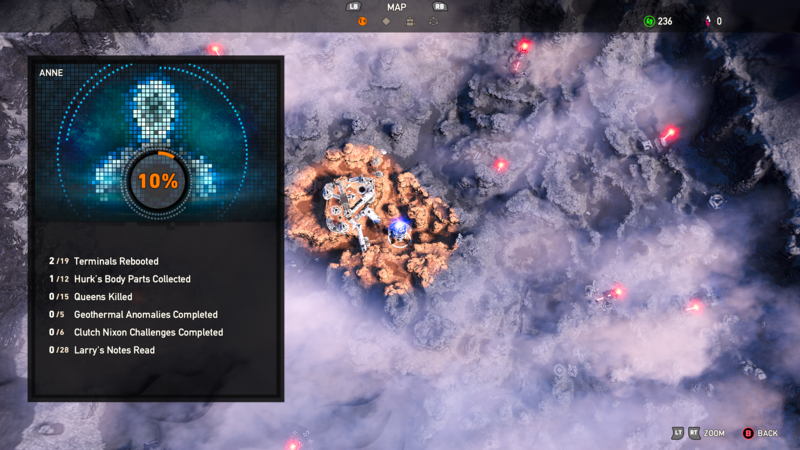 Lost on Mars’ side-content doesn’t boast much variety in and of itself, but happening across these encounters and mini-missions does offer a brief reprieve from the repetitive feel that creeps up after repeating a few of the core gameplay sequences. 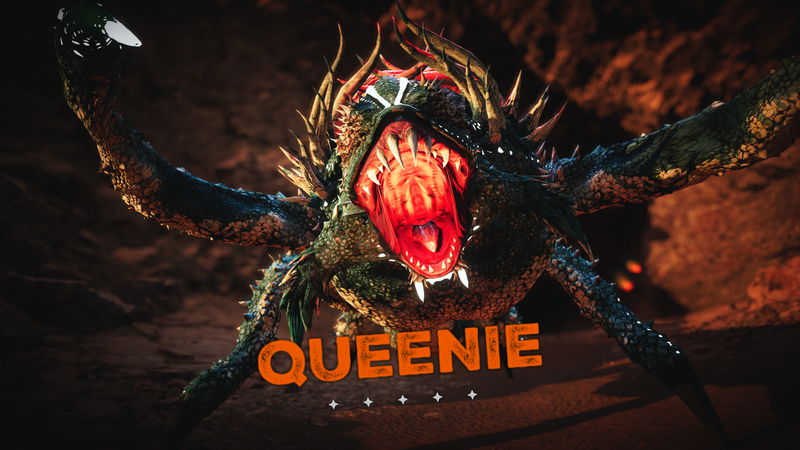 Most of the side missions revolve around killing Arachnid Queens — of which there are 15 to dispatch — or taking a psychedelic trip down a (somewhat literal) rabbit hole filled with hallucinogenic gasses reminiscent of the base game’s Bliss. 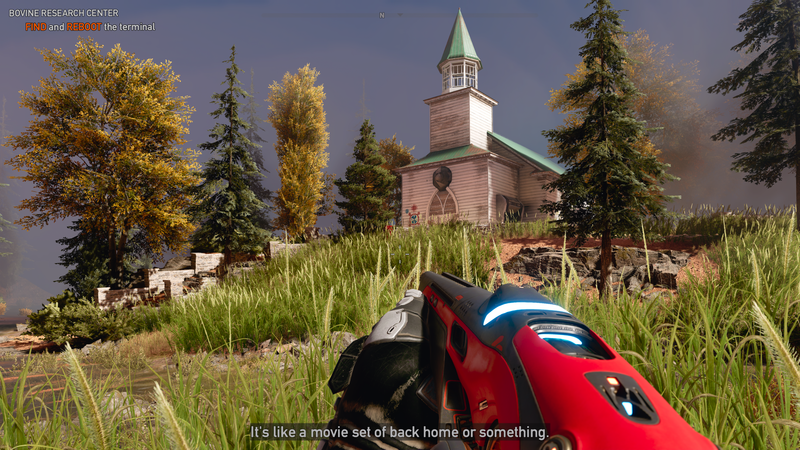 Extending the day-tripping effects of the gas, players are then dropped into bastardized versions of Far Cry 5 locations — such as the iconic Project at Eden’s Gate church, or John Seed’s ranch — and tasked with doling out some given amount of carnage against waves of enemies. Once done, the reward is typically the same: a power core that works to reactivate ANNE’s primary systems in the main questline. In early stages I found myself chasing down less of the hallucination sequences and more of the Queen-hunting missions, but in the end I stopped discriminating; more power cores meant for more cash on hand, which translated to more crafting materials to expand my arsenal against the arachnid forces. I’m growing a little bit weary of Far Cry‘s reliance on the psyche-altering substances found in many of the series’ games, but at the same time accept that it’s simply a staple I need to get past on the road to enjoying the remainder of the content. Just about all activities within the game feed your ability to unlock and craft weaponry and gadgets; you unlock increasingly powerful armaments as you climb towers or open up modules within ANNE’s infrastructure. Equipment — such as expanded pouches for holding consumables — is also periodically unlocked so that when purchased, you can increase passive upgrades for your arsenal. Each and every bit of crafting is derived from a singular ‘unobtanium-adjacent’ resource, Hemoleum — which has been giving another less-than-flattering name by our friend Hurk— and the overall currency system feels somewhat hollow. All chests / lootable containers provide Hemoleum, as do the arachnids you’ve slain along the way. Killing Queens awards more of the space-stuff, and selling off power cores towards the end of your journey gives an additional top-up. Everything funnels Hemoleum into your pockets, and the only place to spend it is in the 3D printers responsible for providing your equipment. As mentioned, it feels hollow, but it would be difficult to expect a more robust system that would pander well to the shorter length of this self-contained episode. Despite the shallow depth to the narrative experience within Lost on Mars as a whole, there’s no question to be had about whether or not the Far Cry‘s particular brand of silliness returns to form with this story and enriches it in its own way. Lost on Mars is, wall to wall, one long Hurk joke. If you enjoyed his companionship in prior Far Cry entries (most notably as a Gun for Hire in Far Cry 5, then you’re bound to enjoy all of the well-set-up jokes, stories, near-miss attempts at political correctness, and more that he has to offer. 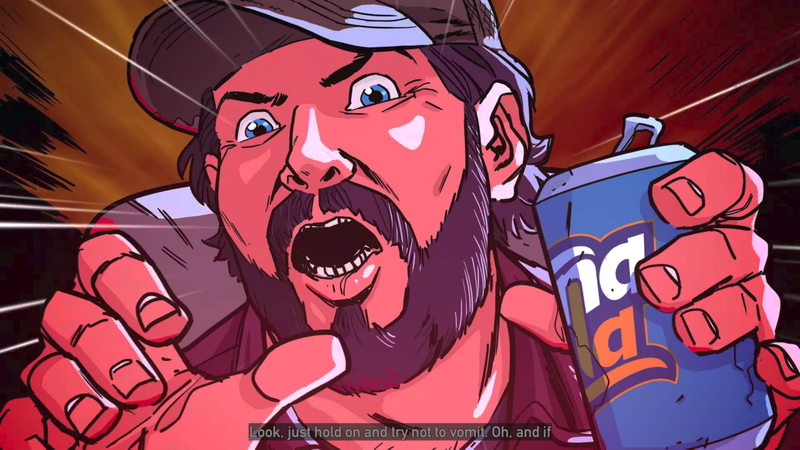 Beyond the ‘stupid redneck’ influence seen planted every rock and pebble within the DLC, science fiction tropes are thrown about aplenty, and a healthy portion of Easter eggs make their appearance. Even the equipment receives the Far Cry treatment with some less-than-appropriate monikers for conventional items such as the consumable shields available for use. The Easter eggs and meta-jokes seemed to arrive right on cue with where my own mind was going at the time; the result of impeccable timing or astounding coincidence. Upon first encountering the arachnids burrowing through the sand to pop up under your feet in a surprise attack, my first thoughts shot to Tremors (1990), one of my favourite movies growing up. About fifteen seconds later, Hurk specifically called out Tremors as a frame of reference while explaining that the only safe bits are on the rocky outcroppings all about. Not long after that, I realized that the return of tower-climbing challenges would form a significant part of getting ANNE back on her feet, and after a few moments Nick cried out something to the tune of ‘but you said I wouldn’t have to do this anymore’ – a reference to Far Cry 5‘s promise to the player that towers would not hold the same role that they did in Far Cry 3 and 4. 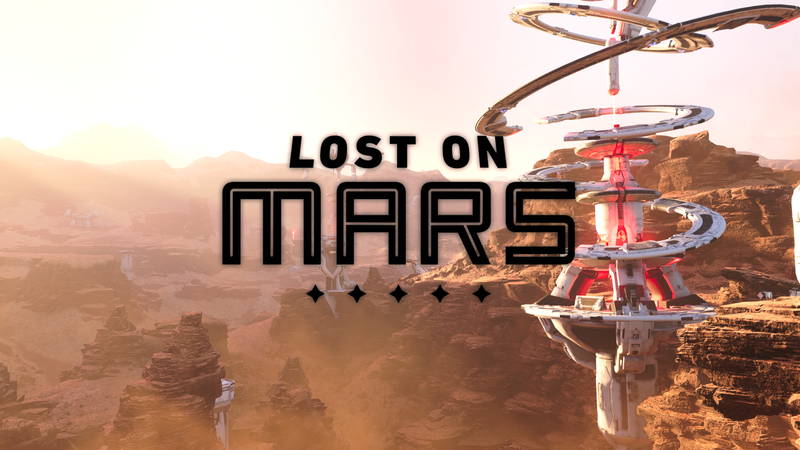 After making my way through Lost on Mars and coming quite close to 100% completion across all of the objectives and side missions, I can say that I certainly enjoyed my time – well enough, at least, to warrant the modest cost of the DLC bundle. There’s no question that it resonated with me better than its predecessor, Hours of Darkness, but I’m still left wanting some more substance out of the content that’s making its way out of Ubisoft Shanghai in support of the base game. There’s nothing inherently bad or disappointing about it; rather, a piece of the puzzle feels left out. There’s plenty of action, humour, production value (the environment really is gorgeous), familiarity, and freedom to tackle it as one pleases, but there’s some quiet little factor missing that could tie the entire experience together more wholesomely. Though Lost on Mars excels in its unending goofiness and leans into every science fiction cliché under the Martian sun, a repetitive questing structure and shallow narrative detracts from its true potential.